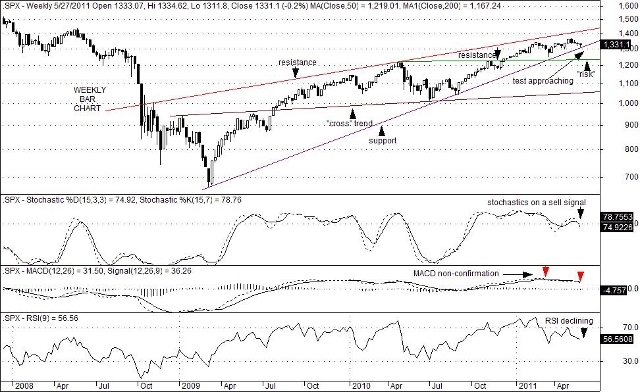 Sideways price activity on modest volume accompanied by a set of technical oscillators rolling over on weekly charts suggests that the S&P 500 Index (SPX) may be nearing a more pronounced corrective phase. The well-advertized end of QE2, sagging real estate numbers, worries over European sovereign debt and a growing expectation that high commodity prices may soon squeeze profit margins have equity investors in a cautious mood. To some degree, this caution is reflected in the U.S. 10-year Treasury note which ended the week yielding a meager 3.06%. From a technical point-of-view, a break below key trend line support at 1,310 could result in a possible move down to the 1,235 area where the next meaningful support sits. The problem is, weekly technical studies are just beginning to turn lower and are relatively far from being considered in an oversold condition. A slow and plodding price decline could eventually drag those oscillators much lower thus avoiding a more worrisome setback. A more rapid decline in equity prices, on the other hand, could force leveraged positions to reduce risk and cause ironically a more troubling outcome. The prevailing thought, which seems to be going around, is that the Fed would likely be forced to become even more creative in its attempt to blunt another panic if one were to present itself. Banks and the banking system would be the center of attention under this type of scenario. Helping equity prices, however, is an apparent improvement in the employment picture, due in large part to gains scored in the private sector. Possible reductions in state and municipal workers during the summer months, however, could mute expectations for a more robust turnaround in employment overall. In any event, a solid break below 1,310 over the near-term on the S&P 500 Index (SPX) would tend to underscore a renewed “aversion to risk” stance that investors may now be adopting. This entry was posted on Tuesday, May 31st, 2011 at 9:36 am	and is filed under The S&P 500 Index (SPX). You can follow any responses to this entry through the RSS 2.0 feed. You can leave a response, or trackback from your own site.